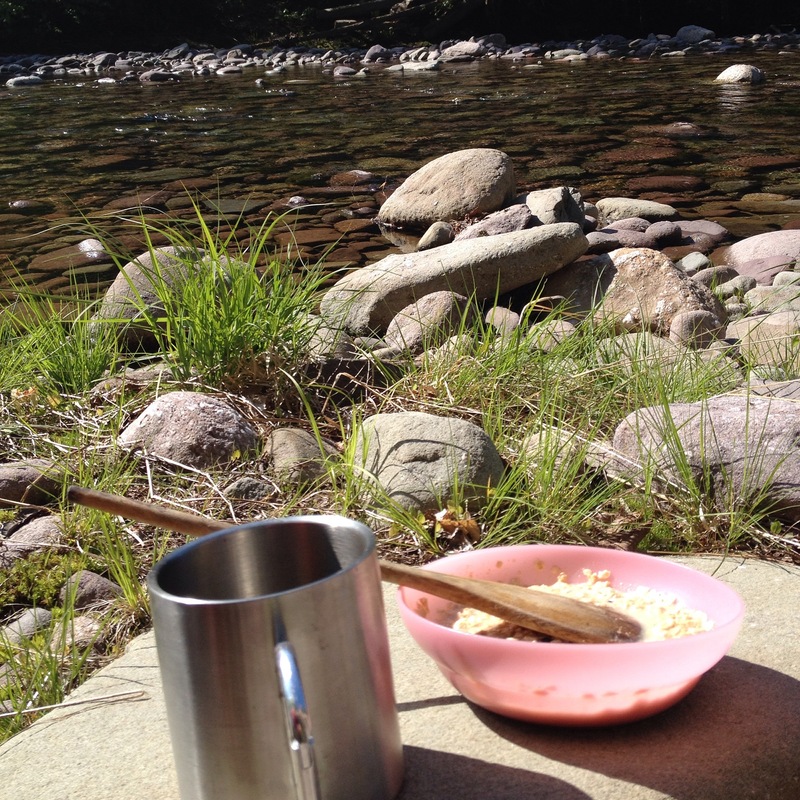 The First Step to Backpacking: Eat Well – What do I eat now? You see, I can’t stop stumbling upon one hiking pun after another since I dug up this video clip: Guy annoys girlfriend during hike with cheesy nature puns. My easily distracted nature is one of the impediments to creating a plan for great, yet lightweight, easily cooked meals on a portable campstove in the backcountry. Our trip involves seven days and six nights among the 2 million acres of remote, geyser-gushing Wyoming wilderness. Yellowstone is the world’s oldest national park, established in 1872 by President Ulysses S. Grant. Want to read more cool park history? Check out this PBS article on Yellowstone. There’s another obstacle besides my “Ooh, look at that pretty tree/sunset/river/cat!” tendencies (which are really advantageous if you want to be good at enjoying the moment, ahem). That roadblock is the big, fuzzy, cuddly (I wish) bear. 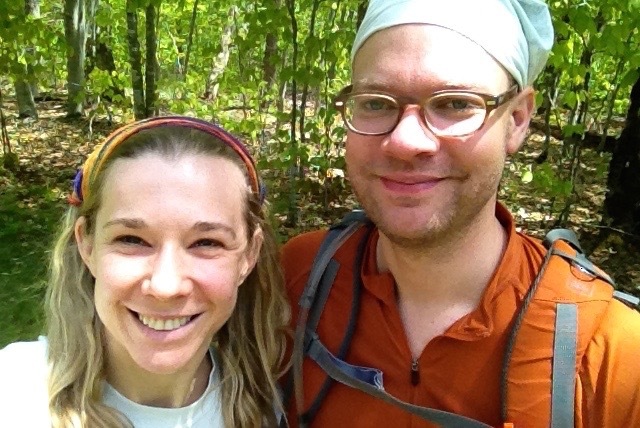 Here we are, happily uneaten by bears in the Catskill Mountains of New York. May the same fate befall us at Yellowstone National Park in Wyoming. Photo by Amy Sowder. Because the park is home to grizzly and black bears, we’ll be packing our handy bear canister for food safekeeping. This canister can conveniently double as a dining chair, I found out. Neat. Still, I don’t mind getting dirty. But I do mind getting mauled by a bear. So maybe snacking inside my sleeping bag while I snuggle in with a good novel lit by book light is out. Is that kinda glampy? I also just learned about this slang term, “glamping,” or glamorous camping. I don’t really think I’ll be veering down the glamping path when everything I’m living on for six nights and seven days is carried on my back as I walk for hours. Wait, why did I sign up for this? Ah, yes, nature and exercise and stuff. I like those things. I also like dining on cuisine that looks like works of abstract art at restaurants helmed by celebrity chefs. So there’s that. 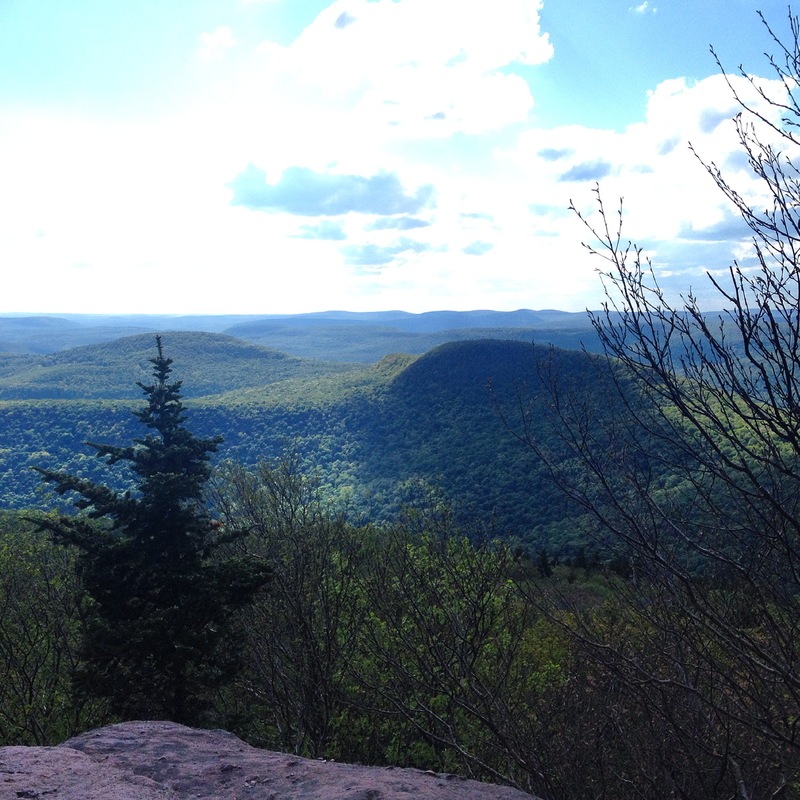 I’ve camped several times throughout my life, but the only other time I’ve ever backpacked was for three days and two nights in the Catskills last May. With 25-ish pounds on my back, I climbed after my long-legged (experienced backpacker) boyfriend up Peekamoose Mountain, one of the steepest inclines in the area with a vertical change of about 2,200 feet, reaching above 3,500 feet total, which “is only recommended for very experienced outdoorsmen,” according to alltrails.com. Well. My struggle was vindicated by this common knowledge we discovered too late. And let me tell you, that was an experience. When we realized our mistake, my boyfriend said, “Just think, every mountain after this will be a breeze. You’ll be all ‘this is nothing compared to Peekamoose! '” Hmph. True. One of the beautiful viewpoints on Peekamoose Mountain that made the steep ascent worthwhile. Photo by Amy Sowder. But I did enjoy the experience of full immersion in wild nature, the exercise, the quiet and losing a cell phone signal. So I’m about to embark again, this time on a trek more than double in duration. Although our chosen Yellowstone hiking trail supposedly doesn’t have much incline at all, it might be cumbersome to breathe as we’ll already be on the Yellowstone Plateau, which is 8,000 feet above sea level. Holy crap. I just looked that up. Did I ever tell you I’m from South Florida, which is at sea level? So this will feel slightly different. Those yellow stones are propped up so high above the ocean for a reason. Apparently, the Yellowstone area formed way back in the day with a series of catastrophic volcanic eruptions. The earth hasn’t stopped crying about it since. The place has more than 300 geysers, the most in the world. It’s probably frowned upon to use those geysers for cooking purposes. So we’ll be boiling our own water on that backcountry stove, which states on the instructions, “a brief soccer ball sized flame is normal.” There may be no need for that book light after all. 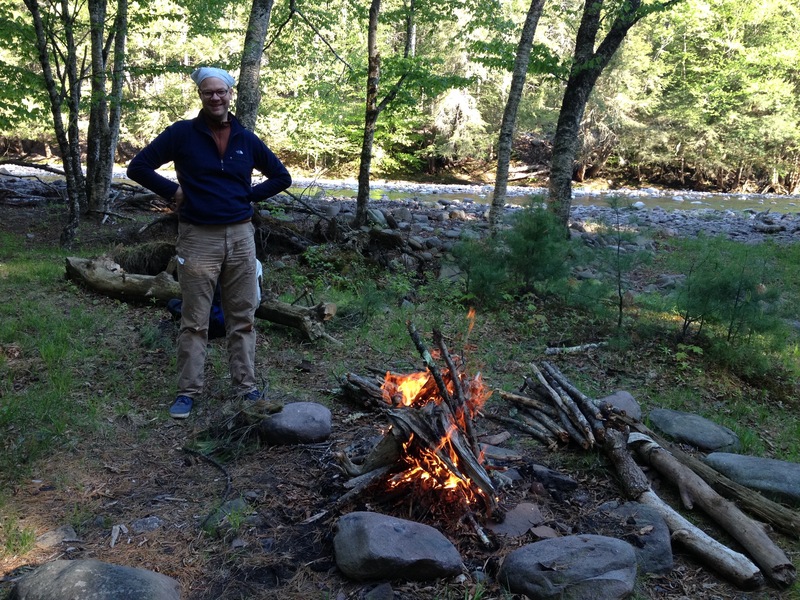 We will not be depending on the oldest cooking style known to mankind, such as this fire created by David. But gazing into a fire is like watching TV: You don’t know why you keep doing it, but you do. Photo by Amy Sowder. Breakfast: Pancakes with maple syrup, biscuits and old-fashioned rolled oats with dried bananas, mango or papaya and nuts — and coffee, duh. Lunch: Wasa Multigrain Crispbread with foil-packed tuna and mayo, crackers with coconut peanut butter or hard cheese, Gala apples and raw baby carrots on the first half of the trip, protein-energy-granola bars, beef jerky and my homemade trail mix with yogurt-covered almonds, sesame seeds, pecans, white raisins and cranberries. Dinner: Whole wheat couscous with chicken, spices and sundried tomatoes; Uncle Ben’s instant brown rice with nuts, ginger, garlic and stir-fried fresh broccoli; swirly whole wheat pasta with tuna (not so keen about this one); and dehydrated packaged meals including Thai Style Chicken and Noodles, Spicy Beef Pasta, Vegetarian Burrito Bowl, Santa Fe Rice & Beans, Chicken Vindaloo and Chana Masala. These are actually pretty good after a strenuous hike. I wish more fresh vegetables and fruits were possible, but that’s only for the beginning of the trip. Unless we forage. Drinks and Dessert: Cocoa, Green tea, chai, black currant tea, apple berry tisane, coffee, water, water, water. Chocolate covered pretzels, cacao energy bites, Ritter Sport chocolate bars with hazelnuts and maybe this brilliant s’mores dip. Dining al fresco is the way to go. Photo by Amy Sowder. All of which brings me to the holy grail of backcountry cuisine: Chocolate Orange Cheesecake. Sounds unsafe. Could be gross. Will I try it?